In July of 2006, I left my parents’ cozy home, where I spent the first 20 years of my life, to become an Au Pair in Charlottesville, Virginia. It was a scary but mostly exciting adventure. I had to start living my life in English, live with a host family, and make new friends. The English part took a while, but the family was extremely welcoming and I met a ton of new friends, especially fellow Au Pairs coming from everywhere around the globe. 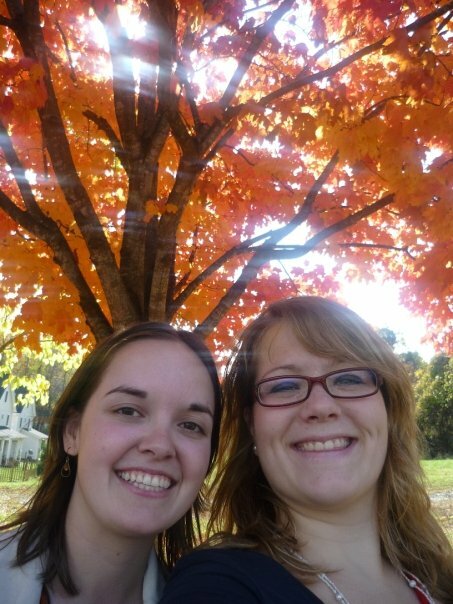 In 2008, my Au Pair contract was over and I chose to stay in Charlottesville, as I had met my future husband a year before. It was nice to stay but it felt weird to see all the girls leave, and being the only one to stick around. Of course, I would love to travel the world and visit my friends in Germany, Mexico, South Africa, Australia, Romania, Austria, and everywhere else. Unfortunately, as long as I am a student, that’s not really an option. I also spend most of my travel opportunities to go back to Quebec, whenever it’s possible and affordable. 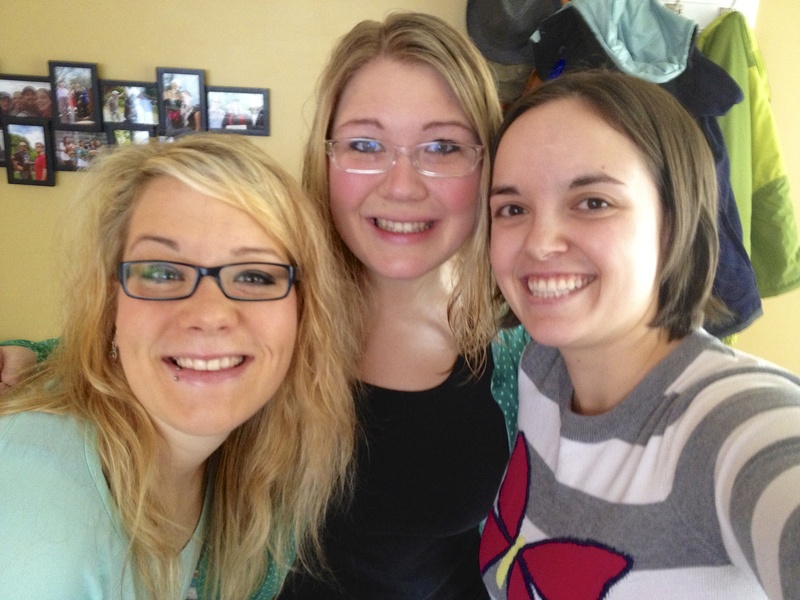 So until I become a world traveler, I at least get to see the girls who are coming back to visit. A few weeks ago, I received a message from Helena, living in Germany, who was planning a visit to Virginia. I couldn’t wait to see her again! We planned to have her, and her lovely friend Inga, over for dinner. They offered to bring an intriguing German dessert and I chose to make burgers, to stick to the American trip theme. Cheesy, I know, but I hadn’t made a good burger in a while so it was a great excuse to make it! 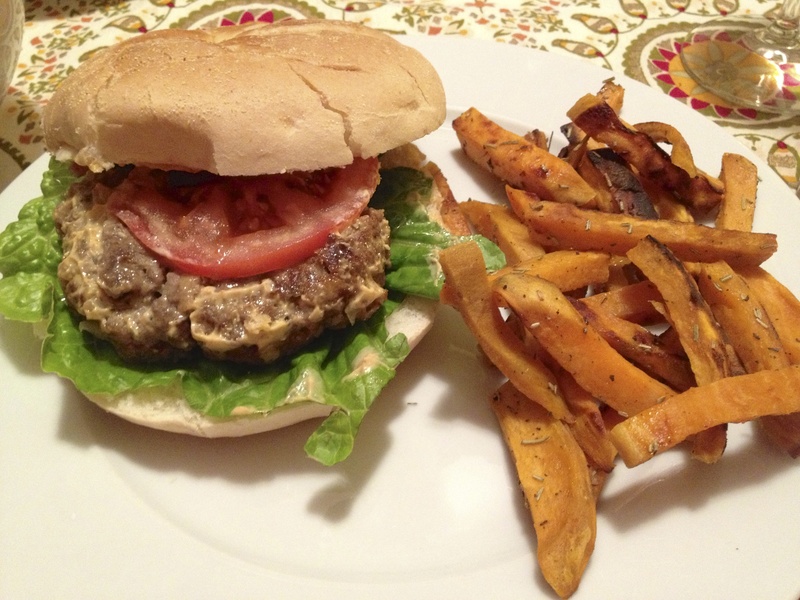 I finally decided to make burgers, a pink aioli, sweet potato fries, and a salad. Because what else would you want floating around your tiny kitchen while trying to put together a big dinner? Use a mortar and pestle to grind the cumin, coriander, sea salt and pepper together. Mix all the ingredients together in a big bowl. It might be easier to use your hands, even if it’s messier. Form the patties, to the size of your choice…mine were on the bigger side. Cook the patties in a medium-hot pan, to taste. The burger with tomato, lettuce and pink aioli, with a side of sweet potato fries. You can use a regular whisk, a food processor, or an immersion blender for this recipe. I used the immersion blender. Blend or whisk together all the ingredients (except the paprika, chili powder and basil) until you get a texture similar to mayonnaise. It only takes a few seconds with the blender. We spread the aioli on the burger buns and also used it to dip the fries. Cut the sweet potatoes in the shape of French fries. Toss all the fries, olive oil, and seasonings in a big bowl until all the fries are well-coated. Use 1 or 2 baking sheets (depending on how big yours are), and spray olive oil on them (although the fries are coated in olive oil, they tend to stick to the baking sheet anyway, if there is no spray). Spread the fries on the baking sheet. 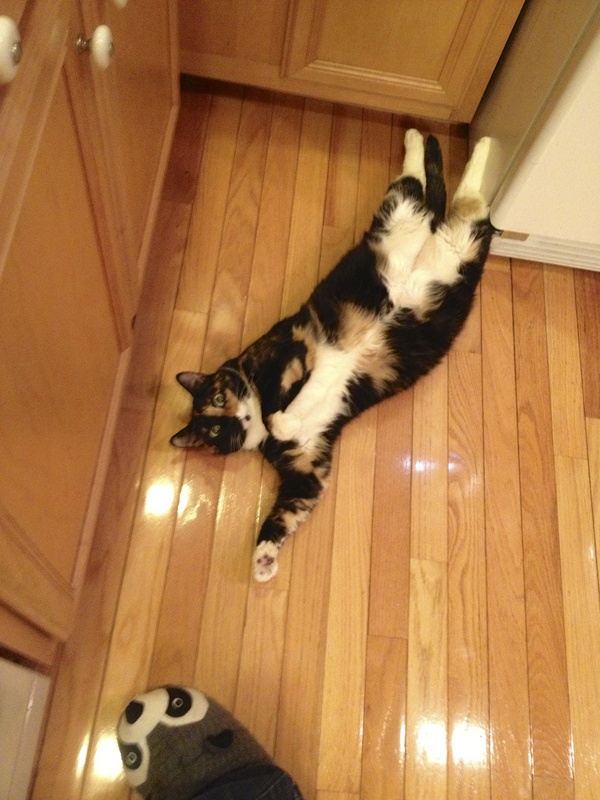 Bake in the oven at 400˚F, for 30 minutes, moving them once or twice during that time, with tongues or a spatula. At the end of the 30 minutes, keep an eye on the fries and take them out once they start to brown. The salad doesn’t really need a big description as it was pretty basic: lettuce, spinach, diced tomatoes, diced cucumbers, and a diced orange. A quickly whipped up vinaigrette with apple cider vinegar, olive oil, lemon juice, salt and pepper. 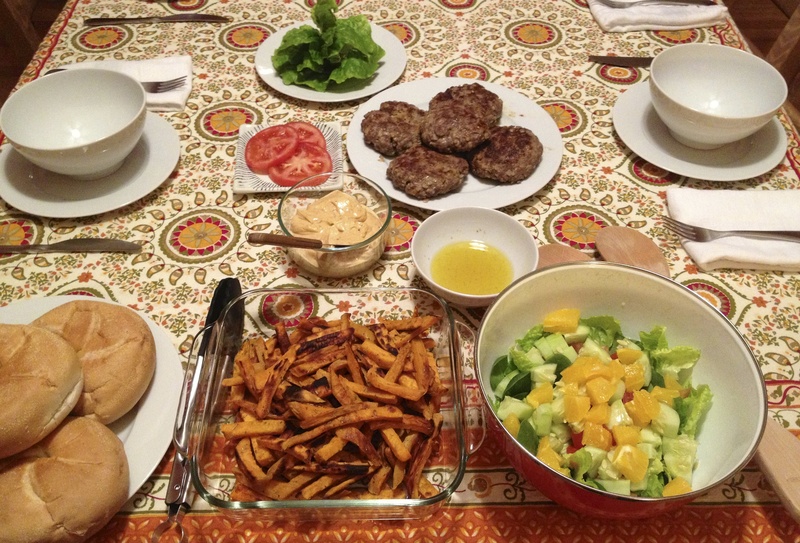 Our dinner: burgers, toppings (including the aioli), sweet potato fries and a salad. The girls were in charge of dessert. They told me it was a holiday classic in Germany called Bratäpfel (literally means “baked apple”…according to Google Translate). I couldn’t wait to try it and, boy, I was not disappointed! Helena brought special mixes from Germany but I would love to figure out how to make it all from scratch at some point. 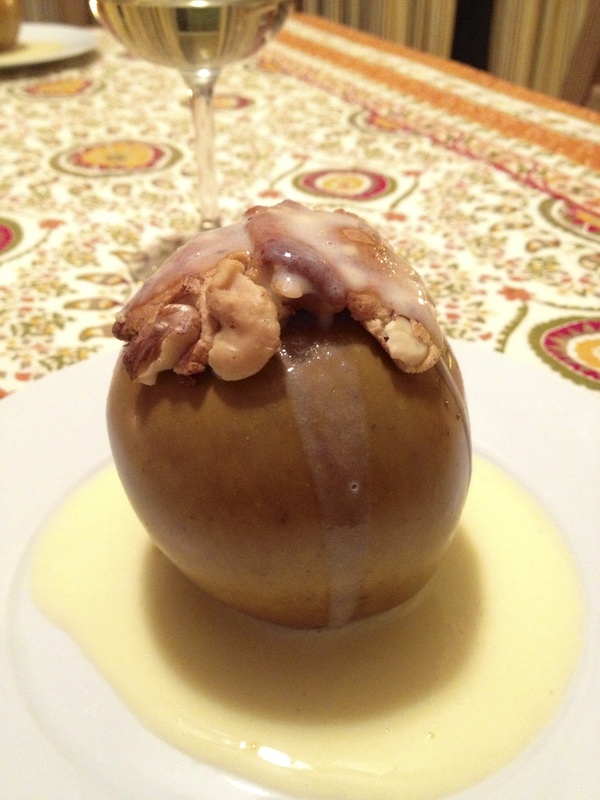 The dish was a baked apple, stuffed with marzipan (a yummy almond paste), raisins, spices (cinnamon and nutmeg), almonds and walnuts. Once it came out of the oven, they drizzled a vanilla sauce on top. The result was amazing. The girls said it wasn’t quite right as the apples were supposed to become so soft that you could eat it with a spoon. Our apples had soften but we still needed a knife to cut them. We figured it might have been the wrong kind of apple. As I had never tasted the original version, I simply thought it was a fun and delicious dish. As if I wasn’t excited enough to see the girls and to try their amazing German dessert, Helena also brought me the motherload of German chocolates! I already started sampling. The pack of mini Bunte Vielfalt made me especially happy because my husband bought me two kinds for Christmas and I was obsessed with it. Now I get a bunch of new flavors to try! 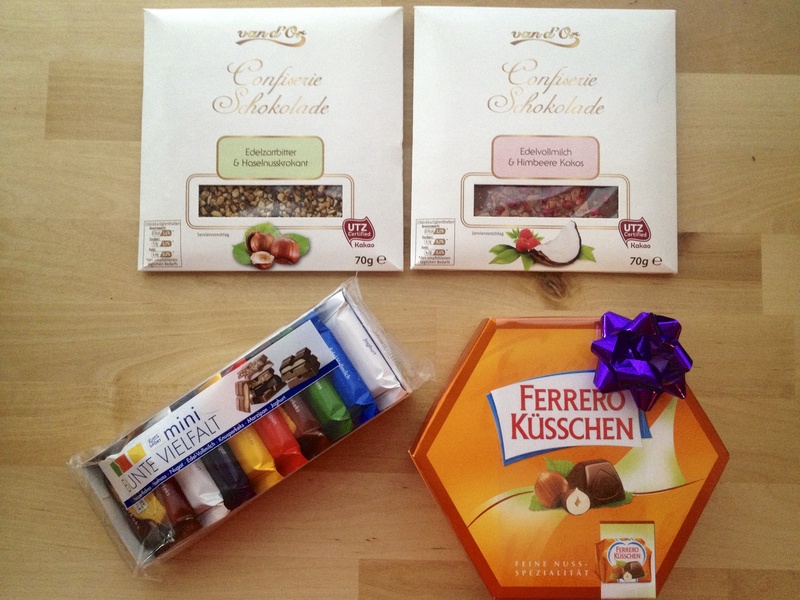 German chocolates from Helena, yum! Hi, I live in Charlottesville. My wife and I are considering the au pair route for childcare. We are just starting to research the situation. Based on your blog, I suspect you (or some of your friends) might have some unique insights that could help our search. Just wondering if you might be willing to discuss over email or phone? Thanks! Hi! I was an AuPair form 2006-2008. 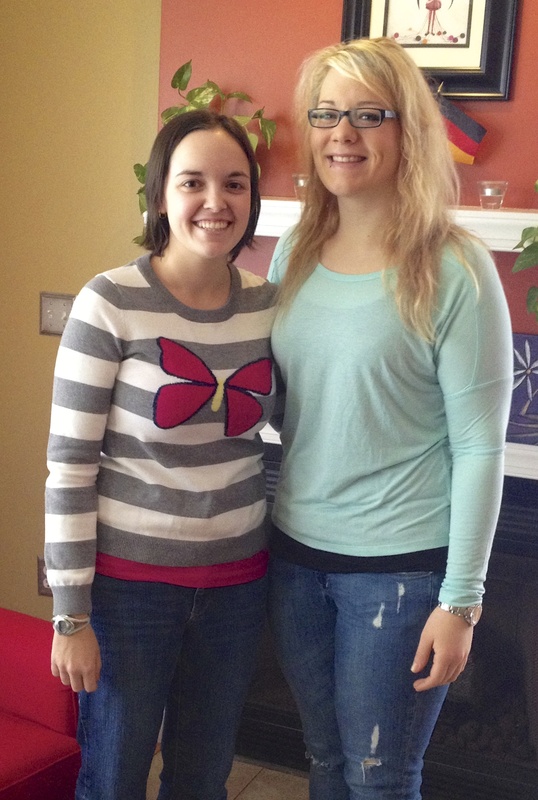 I used the Au Pair in America agency and I had a great experience. They had guidelines that were fair to the Au Pairs as well as the parents and also had a local “counselor” for the girls and their host families. I am still in contact with her and would love to put you in touch with her since she might have more accurate and updated information for you!